Ireland is a great place to live in, but as I already said many times, coming here ten years ago was a bit of a culinary shock for me. It turned out that Irish people don’t eat raw vegetables almost at all, they have no clue what sauerkraut is, they blend all their soups and use buttermilk solely for baking. Well, none of this is any of my business. However, the Irish ignorance in the bread matter has been quite an issue for me. I just couldn’t make any sense of what was on the shelves in shops. There were so-called “pans”, i.e. cardboard tasting, constipation inducing square blocks, there were French baguettes made of de-frozen dough and American-style bagels. Finally, there was the iconic Irish soda bread. You see, I grew up in Eastern Europe where 99% of bread is sourdough. The technical name in Poland for sourdough bread is chleb na zakwasie, but it is only used when two Polish bakers talk to each other. For an average person, chleb na zakwasie is just chleb, i.e. bread. Now, here I am, in 2006, in an Irish shop, and I can see that the only chleb na zakwasie is called “Polish bread”. Needless to say, it was a huge surprise. The thing that I had been taking for granted for almost 30 years of my life and thought to be a part of the common human experience turned out to be something TOTALLY ETHNIC. What the heck? I hope you noticed “Ireland” and “fermentation”. I cannot believe that I have lived to the day when I see those two words so close to each other. In the context of bread, I mean. 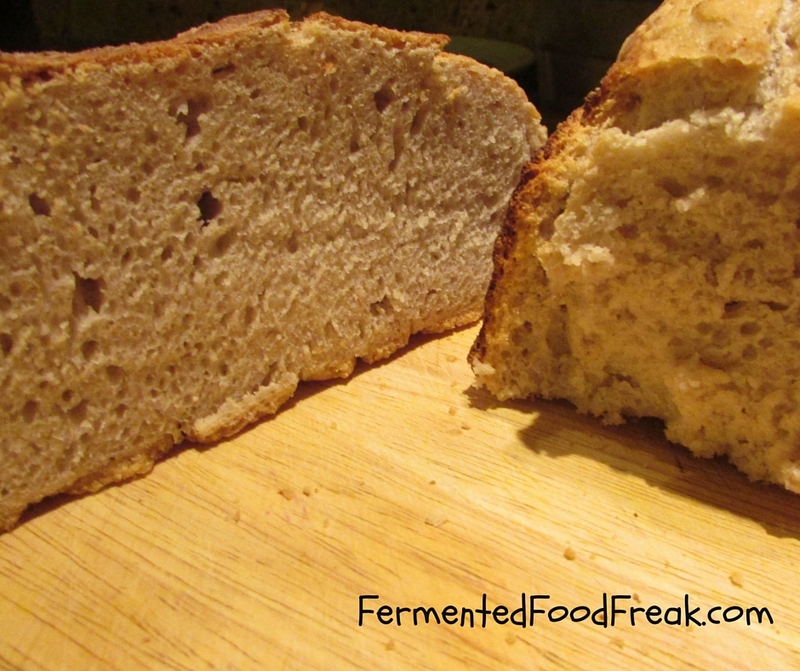 So, when we all finally agreed that “fermented bread” is the REAL BREAD, I am happy to invite you to read my next post where I will give you some information about sourdough. Not that I am an expert, but attended an event recently and got educated a bit. Unfortunately, you cannot comment below if you don’t have a wordpress.com account but I would be delighted if you give me a shout on my Facebook page. I know when you move from country to country, there are a lot of foods you miss, but for some reason a ‘real’ bread is not something you can just leave behind. When I left Russia (where I lived only a few years) I tried to duplicate that wonderful flavour. Only once I started making real sourdough did I manage to recreate my favourite (borodinski) and what a relief! So I know pretty much how you feel. I look forward to your next post. Thank you for the comment, Hilda! I am happy you are my fellow sourdough lover. Russian bread is the king of all breads, I think. You are really lucky to have tasted in an original form. That Bulgarian baker at the fermentation festival really inspired you, didn’t he? Oh, yes, he is awesome!